Inflatable 3-Lane Bungee Run Rental | FroggyHops.com Minneapolis MN. Strap in! This increasingly popular inflatable game is perfect for the thrill-seeker in all of us! Three participants compete side-by-side on this 3-Lane Bungee Run game. To play, each player begins by putting on a harness vest. This vest is easy to operate, buckle into place, and pull the straps to adjust the tightness. The rental of this inflatable comes with different sizes of vests to accommodate various-sized Participants. Then, a bungee cord is easily connected onto the back of each vest with a simple locking clip. With their hand on the back wall to start, the Particpants must run forward as fast and hard as they can to stretch the bungee cord. When they have reached as far forward as they can possibly pull, they can place a Velcro marker on the side-wall to mark their distance. These Velcro batons are included in the rental. But watch out!! The bungee cord then yanks each Participant backwards and into the inflatable floor and back-wall providing good laughs for each Participant, but even more entertainment for the viewers! Whoever can place his or her Velcro baton the furthest is the winner of this fun and entertaining game! 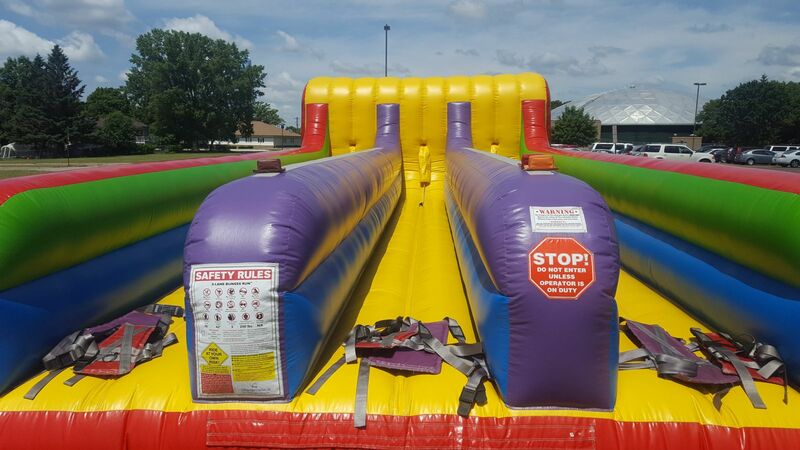 The 3-Lane Bungee Run is perfect to provoke some good laughs at graduation parties, All-Night Senior parties, school carnivals, city festivals, company picnics, or any event! Recommended for ages 10 and older. 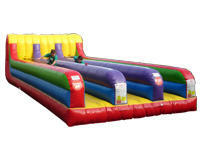 Click here for Package Deals with the Inflatable 3-Lane Bungee Run.